Microsoft Surface Book 2 launched with 13.5/15-inch PixelSense display, Windows 10 Pro and 17 hours of battery life. Today, Microsoft introduce the latest in the Surface family: Surface Book 2 - a powerhouse laptop with amazing graphics and up to 17 hours of battery life. Now available in a 13" and 15" option, Surface Book 2 is the most powerful Surface Microsoft ever built. With the latest 8th Generation Intel Dual-Core and Quad-Core processors and NVIDIA GeForce GPUs, Surface Book 2 has up to five times the graphics performance of the original Surface Book and is twice as powerful as the new MacBook Pro. Microsoft's Surface Book 2 is available in 13 inch and 15 inch option. Surface Book 2's features vibrant and crisp PixelSense Display with multi-touch, Surface Pen, and Surface Dial on-screen support. The 15" Surface Book 2 delivers almost seven million dazzling pixels - 45% more than the MacBook Pro - giving artists and professionals alike amazing pixel density on an even larger creative canvas. Surface Book 2 has been redesigned to provide a smoother, faster detach into Tablet or Studio Mode. And when you detach to sketch an idea or watch a video, the Surface Book 2 turns into the world's thinnest and lightest 8th Gen Intel Core i7 PC. 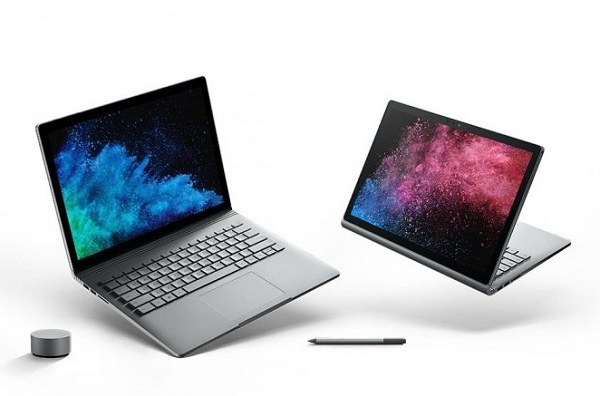 Surface Book 2 brings you a full array of ports, including USB-A, USB-C, and full-size SD card reader which makes it easy to connect other devices, accessories and memory cards without the need for a bag full of dongles. With the latest 8th Gen Intel Core processors and NVIDIA GeForce GTX 1050 and 1060 discrete graphics options, Surface Book 2 is up to five times more powerful than the original and is twice as powerful as the latest MacBook Pro. All this power and Surface Book 2 still provides all-day battery life - up to 17 hours. That's 70% more than the latest MacBook Pro. Surface Book 2 with the 13" weighs 3.38lbs and the 15" Surface Book 2 at 4.2lbs. Surface Book 2 is powerful enough to handle the most popular PC games at 1080p and 60 FPS - in some cases matching the graphics performance of game consoles like Xbox One. With built-in Xbox One Wireless support on the 15" you can pair your Xbox One controllers and compatible headsets to play with no cords or additional dongles required. Surface Book 2 is ready for Windows Mixed Reality Ultra. Connect a compatible headset and controller for apps and experiences with crisper visuals and a higher refresh rate (90 frames per second), including the highest-performance VR games. The new Surface Book 2 laptops start at $1499. Surface Book 2 13" will be available for pre-order beginning November 9th in the United States and additional markets around the world, along with Surface Book 2 15" in the United States at your local Microsoft Store and Microsoft.com. Delivery will begin on November 16th.